Bandurka A.M. and Litvinov A.N., 2015. Reforming the criminal-executive policy of Ukraine in the context of the European choice [Reformirovanie ugolovno-ispolnitel`noi politiki Ukrainy v kontekste evropeiskogo vybora]. In: Kharkiv National University of Internal Affairs et al. Modern problems and tendencies of development of criminal-executive law in Ukraine [Suchasni problemy ta tendentsii rozvytku kryminalno-vykonavchoho prava v Ukraini]. Kharkiv, 20 November. Kharkiv: Kharkivskyi natsionalnyi universytet vnutrishnikh sprav. Pp. 7-10. Sakhnik O.V., 2016. Psychological aspects of professional self-actualization of the employees of the penitentiary system of Ukraine in the current conditions of its reformation [Psyholohichni aspekty profesiinoi samorealizatsii pratsivnykiv penitentsiarnoi systemy Ukrainy v suchasnykh umovakh ii reformuvannia]. In: Ministry of Justice of Ukraine et al. Urgent issues of modernizing legislation and education in the condition of European integration process of Ukraine [Aktualni problemy modernizatsii zakonodavstva ta osvity v umovakh yevrointehratsiinoho postupu Ukrainy]. Chernihiv, 27-28 October. Chernihiv: Desna Polihraf. Pp. 250-252. Suslov Yu.Ye., 2015. Psychological and acmeological readiness of the staff of the criminal executive system to innovate reforming [Psikhologo-akmeologicheskaya gotovnost` sotrudnikov ugolovno-ispolnitel`noi sistemy k innovatsiyam reformirovaniya]. Ph.D. dissertation. N.A.Nekrasov Kostroma State University. Kolesnichenko O.S., 2016. Modern state of elaborating the problem of psychological readiness for professional activities [Suchasnyi stan rozroblennia problem psykholohichnoi hotovnosti do profesiinoi diialnosti]. In: The psychological readiness of the servicemen of the National Guard of Ukraine to military service beyond the point of permanent disposition [Psykholohichna gotovnist viiskovosluzhbovtsiv Natsionalnoi hvardii Ukrainy do sluzhbovo-boiovoi diialnosti poza mezhamy punktu postiinoi dyslokatsii]. Kharkiv: Natsionalna akademiia Natsionalnoi hvardii Ukrainy. Pp. 8-21. Smila N.V., 2018. Features of the psychological readiness of the future doctor to professional activity [Osoblyvosti psykholohichnoi hotovnosti maibutnoho likaria do profesiinoi diialnosti]. Ph.D. dissertation. G.S.Kostiuk Institute of Psychology of NAPS of Ukraine. Vorobyova I.V., Kolesnichenko O.S. and Matsegora Ya.V., 2013. Model of professional psychological readiness for the activities of representatives of risky occupations [Model profesiinoi psykholohichnoi hotovnosti do diialnosti predstavnykiv ryzykonebezpechnykh profesii]. Problems of extreme and crisis psychology [Problemy ekstremalnoi ta kryzovoi psykholohii], No. 14 (1), pp. 71-93. Brynza I.V. and Budiianskyi M.F., 2016. Readiness for change as a resource to overcome the psychological crisis [Hotovnist do zmin yak resurs podolannia psykholohichnoi kryzy]. Nauka ì osvita – Science and education, No. 11, pp. 43-48. Terekhin R.A., 2018. Psychological readiness of servicemen for changes in the work situation in the process of military professional socialization [Psikhologicheskaya gotovnost` voennosluzhashchikh k izmeneniyam sluzhebnoi situatsii v protsesse voenno-professional`noi sotsializatsii]. Ph.D. dissertation. Saratov Military Order of Zhukov Red Banner Institute of National Guard Forces. 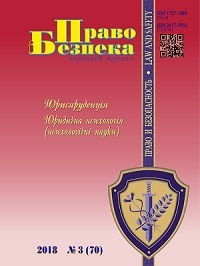 Naumtseva E.A., 2016. Psychological readiness for organizational change: approaches, concepts, methods [Psikhologicheskaya gotovnost` k organizatsionnym izmeneniyam: podkhody, ponyatiya, metodiki]. Organizational psychology, No. 2, pp. 55-74. Panchenko S.M., 2016. Personality maturity: the essence and prospects of actualization in the conditions of postgraduate education [Osobystisna zrilist: sutnist i perspektyvy aktualizatsii v umovakh pisliadyplomnoi osvity]. Vìsnik pìslâdiplomnoï osvïti – Bulletin of postgraduate education, Iss. 1, part 2, pp. 308-316. Shtepa O.S., 2008. Personal maturity: Model. Questionnaire, Training [Osobystisna zrilist: Model. Opytuvalnyk. Trening]. Lviv: Vydavnychyi tsentr LNU imeni Ivana Franka. Chiker V.A., Kapustina A.N. and Zakharova A.M., 2007. 18 training programs: A guide for professionals [18 programm treningov: Rukovodstvo dlya professionalov]. St. Petersburg: Rech`. (Ed. : Chiker V.A.). Mitroshkina, O. (2018) Специфіка психологічної готовності до змін та особистісної зрілості у працівників кримінально-виконавчої служби, Право і безпека, 70(3), pp 64-70. doi: 10.32631/pb.2018.3.09.